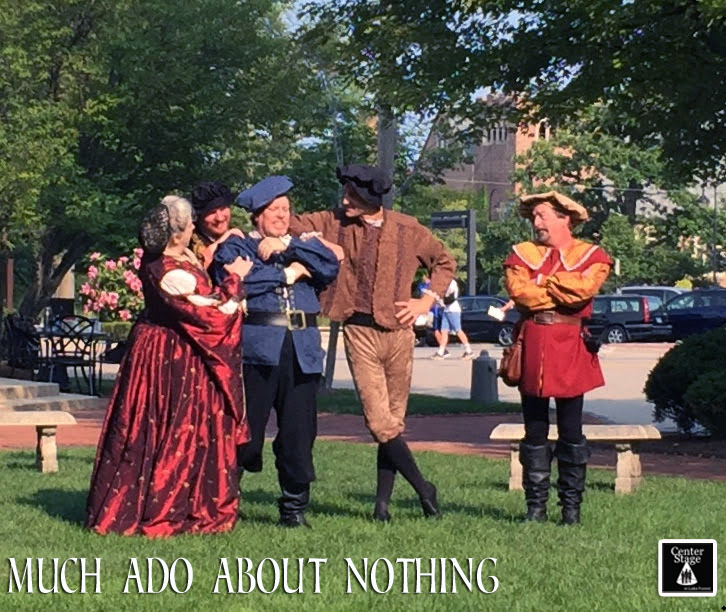 August 2018 brought CenterStage in Lake Forest’s second Shakespeare in the Parks Tour—and another comedy from the Bard’s canon: director Barbara Anderson’s adaptation of his 1598 masterpiece, Much Ado About Nothing. Shakespeare’s wittiest romantic comedy, Much Ado paradoxically brings both the impetuous young love of Claudio and Hero, and the reluctant “old” love of Benedick and Beatrice to happy endings by way of trickery and deception–venomous on the one hand, and laughingly well-meaning on the other. Shakespeare reminds us that though “the course of true love never runs smooth,” it often ultimately brings both the young and the old to great happiness. 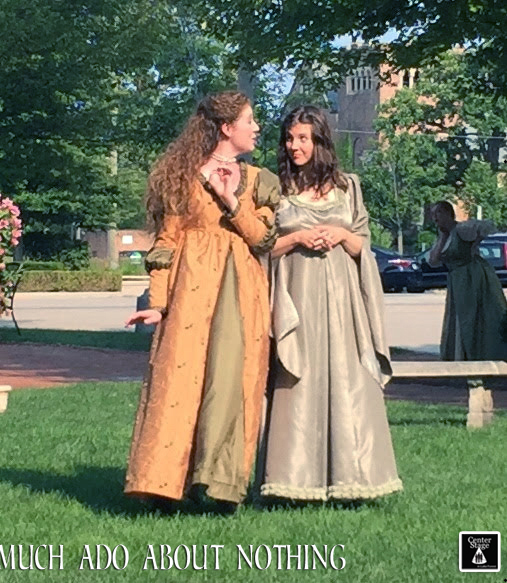 Our 2018 troupe of talented actors performed to enthusiastic audiences in Lake Forest’s Market Square, Open Lands Park, and West Park; Lake Bluff’s Village Green; the courtyard of Sacred Heart Church in Winnetka; and on the stage of City Lit Theatre in Chicago. 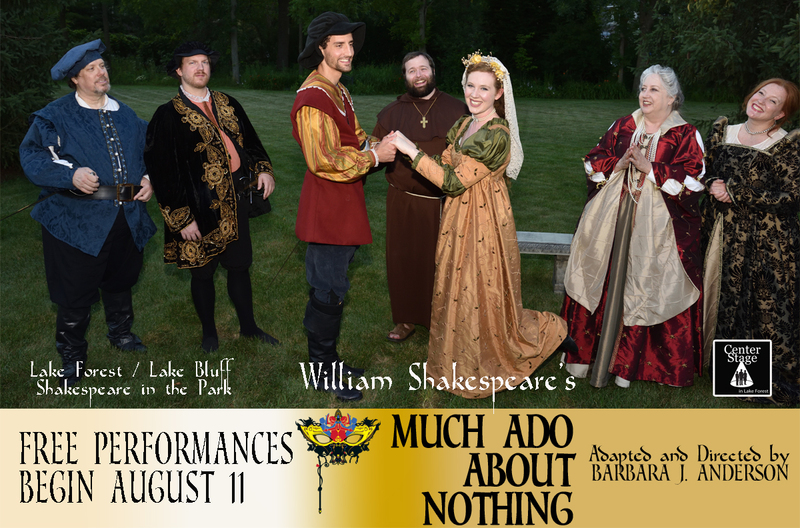 Much Ado About Nothing, CenterStage in Lake Forest’s second year offering of Free Shakespeare in the Park, was a splendid adaptation of Shakespeare’s wittiest comedy. The images above show the production in its premiere performance in Lake Forest’s Market Square. Performances on the Lake Bluff Green, in West Park, in Winnetka and in Chicago followed over 5 weekends. For Much Ado About Nothing performance image galleries, go to the next page.